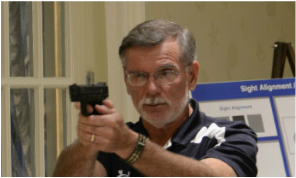 Meet Gary W. Easton N R A Certified Pistol Instructor United States Army Trained and Certified Florida Concealed Weapons Instructor N R A Range Safety Officer Florida and Georgia State Licenced Our training Philosophy is that you should not be afraid of a gun . You should always respect a firearm, but never be in fear to use one. With the proper training and practice, your firearm should become a good friend. A friend you will have for the rest of your life. We work with individuals, couples, and small groups. All instruction is designed for the individual student. We specialize in people who are new to firearms, or who may have some kind of a physical limitation, such as lack of strength, poor eyesite, or problems brought on by age. All of our programs are specifically designed to the individual students needs.